Ahhh. the good old day's when something was for free! This Pattern made by the HLC was a premium product that was distributed in the boxes of Duz Detergent in the 1950's. 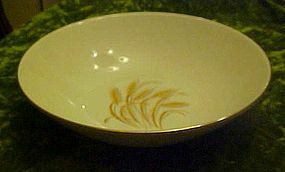 This Homer Laughlin Golden Wheat serving bowl is in excellent condition and measures 8 5/8" in diameter and 2 3/8" deep. Looks as if has never been used and has been cabinet kept. 2 available and price is per bowl. I will be listing LOTS of this pattern. ALL LIKE NEW!